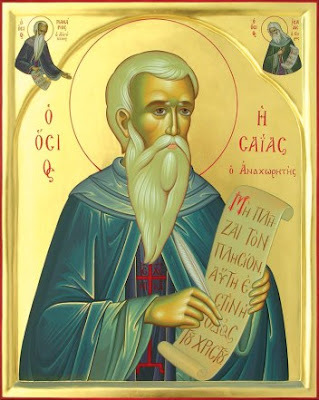 According to St. Nikodemos the Hagiorite, St. Isaiah the Anchorite, or the Solitary, lived around the year 370 and was a contemporary of Makarios the Great of Egypt. Most historians today consider him to be later in date. He is now usually identified with a monk who lived initially at Scete in Egypt, and who then moved to Palestine at some date subsequent to 431, eventually dying in great old age as a recluse near Gaza on 11 August 491 (according to others, 489). Whichever date is preferred, it is evident that the author reflects the authentic spirituality of the Desert Fathers of Egypt and Palestine during the fourth and fifth centuries. St. Nikodemos commends in particular his advice on the rebuttal of demonic provocations and on the need to be attentive to the conscience. St. Nikodemos here gives in the first volume of the Philokalia no more than short extracts from a much longer work. 1. There is among the passions an anger of the intellect, and this anger is in accordance with nature. Without anger a man cannot attain purity: he has to feel angry with all that is sown in him by the enemy. When Job felt this anger he reviled his enemies, calling them "dishonorable men of no repute, lacking everything good, whom I would not consider fit to live with the dogs that guard my flocks' (cf Job 30:1, 4. LXX). He who wishes to acquire the anger that is in accordance with nature must uproot all self-will, until he establishes within himself the state natural to the intellect. 2. If you find yourself hating your fellow men and resist this hatred, and you see that it grows weak and withdraws, do not rejoice in your heart; for this withdrawal is a trick of the evil spirits. They are preparing a second attack worse than the first; they have left their troops behind the city and ordered them to remain there. If you go out to attack them, they will flee before you in weakness. But if your heart is then elated because you have driven them away, and you leave the city, some of them will attack you from the rear while the rest will stand their ground in front of you; and your wretched soul will be caught between them with no means of escape. The city is prayer. Resistance is rebuttal through Christ Jesus. The foundation is intensive power. 3. Let us stand firm in the fear of God, rigorously practicing the virtues and not giving our conscience cause to stumble. In the fear of God let us keep our attention fixed within ourselves, until our conscience achieves its freedom. Then there will be a union between it and us, and thereafter it will be our guardian, showing us each thing that we must uproot. But if we do not obey our conscience, it will abandon us and we shall fall into the hands of our enemies, who will never let us go. This is what our Lord taught us when He said: 'Come to an agreement with your adversary quickly while you are with him in the road, lest he hand you over to the judge, and the judge deliver you to the officer and you are cast into prison (Matt. 5:25). The conscience is called an 'adversary' because it opposes us when we wish to carry out the desires of our flesh; and if we do not listen to our conscience, it delivers us into the hands of our enemies. 4. If God sees that the intellect has entirely submitted to Him and puts its hope in Him alone. He strengthens it, saying: 'Have no fear Jacob my son, my little Israel" (Isa. 41:14. LXX), and: 'Have no fear: for I have delivered you, I have called you by My name; you are Mine. If you pass through water, I shall be with you, and the rivers will not drown you. If you go through fire, you will not be burnt, and the names will not consume you. For I am the Lord your God, the Holy One of Israel, who saves you' (cf . Isa. 43:1-3. LXX). 5. When the intellect hears these words of reassurance, it says boldly to its enemies: 'Who would fight with me? Let him stand against me. And who would accuse me? Let him draw near to me. Behold, the Lord is my helper; who will harm me? Behold, all of you are like an old moth-eaten garment' (cf Isa. 50:8-9. LXX). 6. If your heart comes to feel a natural hatred for sin, it has defeated the causes of sin and freed itself from them. Keep hell's torments in mind: but know that your Helper is at hand. Do nothing that will grieve Him, but say to Him with tears: 'Be merciful and deliver me, Lord, for without Thy help I cannot escape from the hands of my enemies. " Be attentive to your heart, and He will guard you from all evil. 10. If your intellect is freed from all its enemies and attains the Sabbath rest, it lives in another age, a new age in which it contemplates things new and undecaying. For 'wherever the dead body is, there will the eagles be gathered together' (Matt. 24: 28). 11. The demons cunningly withdraw for a time in the hope that we will cease to guard our heart, thinking we have now attained peace, then they suddenly attack our unhappy soul and seize it like a sparrow. Gaining possession of it, they drag it down mercilessly into all kinds of sin, worse than those which we have already committed and for which we have asked forgiveness. Let us stand, therefore, with fear of God and keep guard over our heart, practicing the virtues which check the wickedness of our enemies. 12. Our teacher Jesus Christ, out of pity for mankind and knowing the utter mercilessness of the demons, severely commands us: 'Be ready at every hour, for you do not know when the thief will come; do not let him come and find you asleep' (cf Matt. 24:42-43). He also says: "Take heed, lest your hearts be overwhelmed with debauchery and drunkenness and the cares of this life, and the hour come upon you unawares' (cf. Luke 21 :34). Stand guard, then, over your heart and keep a watch on your senses; and if the remembrance of God dwells peaceably within you, you will catch the thieves when they try to deprive you of it. When a man has an exact knowledge about the nature of thoughts,* he recognizes those which are about to enter and defile him, troubling the intellect with distractions and making it lazy. Those who recognize these evil thoughts for what they are remain undisturbed and continue in prayer to God. 13. Unless a man hates all the activity of this world, he cannot worship God. What then is meant by the worship of God? It means that we have nothing extraneous in our intellect when we are praying to Him: neither sensual pleasure as we bless Him, nor malice as we sing His praise, nor hatred as we exalt Him, nor jealousy to hinder us as we speak to Him and call Him to mind. For all these things are full of darkness; they are a wall imprisoning our wretched soul, and if the soul has them in itself it cannot worship God with purity. They obstruct its ascent and prevent it from meeting God: they hinder it from blessing Him inwardly and praying to Him with sweetness of heart, and so receiving His illumination. As a result the intellect is always shrouded in darkness and cannot advance in holiness, because it does not make the effort to uproot these thoughts by means of spiritual knowledge. 14. When the intellect rescues the soul's senses from the desires of the flesh and imbues them with dispassion,* the passions shamelessly attack the soul, trying to hold its senses fast in sin; but if the intellect then continually calls upon God in secret. He, seeing all this, will send His help and destroy all the passions at once. 16. He who receives no help when, at war should feel no confidence when at peace. 18. Once you have begun to seek God with true devotion and with all your heart, then you cannot possibly imagine that you already conform to His will. So long as your conscience reproves you for anything that you have done contrary to nature, you are not yet free: the reproof means that you are still under trial and have not yet been acquitted. But if you find when you are praying that nothing at all accuses you of evil, then you are free and by God's will have entered into His peace. If you see growing within yourself a good crop, no longer choked by the tares of the evil one; if you find that the demons have reluctantly withdrawn, convinced that it is no use making further attacks on your senses; if 'a cloud overshadows your tent (cf Exod. 40:34), and 'the sun does not bum you by day, nor the moon by night' (Ps. 121:6); if you find yourself equipped to pitch your tent and keep it as God wishes - if all this has happened, then you have gained the victory with God's help, and henceforward He will Himself overshadow your tent, for it is His. 22. Be attentive to yourself, so that nothing destructive can separate you from the love of God. Guard your heart and do not grow listless and say: 'How shall I guard it, since I am a sinner?' For when a man abandons his sins and returns to God, his repentance regenerates him and renews him entirely. 23. Holy Scripture speaks everywhere about the guarding of the heart, in both the Old and the New Testaments. David says in the Psalms: '0 sons of men, how long will you be heavy of heart?' (Ps. 4:2. LXX), and again: 'Their heart is vain' (Ps. 5:9. LXX); and of those who think futile thoughts, he says: 'For he has said in his heart, I shall not be moved' (Ps. 10:6), and: 'He has said in his heart, God has forgotten' (Ps. 10:11). 24. In storms and squalls we need a pilot, and in this present life we need prayer: for we are susceptible to the provocations of our thoughts, both good and bad. If our thought is full of devotion and love of God, it rules over the passions. As hesychasts, we should discriminate between virtue and vice with discretion and watchfulness: and we should know which virtues to practice when in the presence of our brethren and elders and which to pursue when alone. We should know which virtue comes first, and which second or third; which passions attack the soul and which the body, and also which virtues concern the soul and which the body. We should know which virtue pride uses in order to assault the intellect, and which virtue leads to vainglory, wrath or gluttony. For we ought to purify our thoughts from 'all the self-esteem that exalts itself against the knowledge of God' (2 Cor. 10:5). 25. The first virtue is detachment, that is, death in relation to every person or thing. This produces the desire for God, and this in turn gives rise to the anger that is in accordance with nature, and that flares up against all the tricks of the enemy. Then the fear of God will establish itself within us, and through this fear love will be made manifest. 26. At the time of prayer, we should expel from our heart the provocation of each evil thought, rebutting it in a spirit of devotion so that we do not prove to be speaking to God with our lips, while pondering wicked thoughts in our heart. God will not accept from the hesychast a prayer that is turbid and careless, for everywhere Scripture tells us to guard the soul's organs of perception. If a monk submits his will to the law of God, then his intellect will govern in accordance with this law all that is subordinate to itself. It will direct as it should all the soul's impulses, especially its intensive power and desire, for these are subordinate to it. We have practiced virtue and done what is right, turning our desire towards God and His will, and directing our incentive power, or wrath, against the devil and sin. What then do we still lack'? Inward meditation. 27. If some shameful thought is sown in your heart as you are sitting in your cell, watch out. Resist the evil, so that it does not gain control over you. Make every effort to call God to mind, for He is looking at you, and whatever you are thinking in your heart is plainly visible to Him. Say to your soul: 'If you are afraid of sinners like yourself seeing your sins, how much more should you be afraid of God who notes everything?' As a result of this warning the fear of God will be revealed in your soul, and if you cleave to Him you will not be shaken by the passions: for it is written: 'They that trust in the Lord shall be as Mount Zion: he that dwells in Jerusalem shall never be shaken' (Ps. 125:1. LXX). Whatever you are doing, remember that God sees all your thoughts, and then you will never sin. To Him be glory through all the ages. Amen. * INTELLECT (νοῦς - nous): the highest faculty in man, through which - provided it is purified - he knows God or the inner essences or principles of created things by means of direct apprehension or spiritual perception. Unlike the dianoia or reason, from which it must be carefully distinguished, the intellect does not function by formulating abstract concepts and then arguing on this basis to a conclusion reached through deductive reasoning, but it understands divine truth by means of immediate experience, intuition or 'simple cognition' (the term used by St. Isaac the Syrian). The intellect dwells in the 'depths of the soul'; it constitutes the innermost aspect of the heart. The intellect is the organ of contemplation, the 'eye of the heart'. From G.E.H. Palmer, Philip Sherrard, and Bishop Kallistos Ware, trans. and eds., The Philokalia: The Complete Text (vol. 1), (London: Faber and Faber, 1979).